Your legitimate customers should never be made to feel like criminals. Yet that is exactly what some premium content producers do. 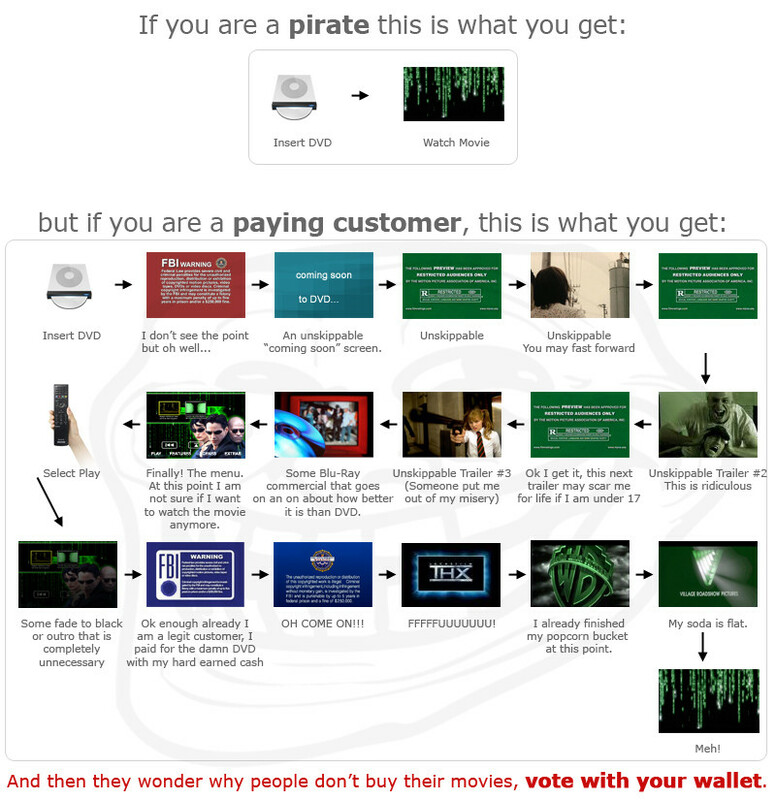 The viral “if you are a pirate, this is what you get” infographic (via makinglight) illustrates this perfectly in the context of the movie industry. Movie pirates actually get a better experience than legitimate movie buyers who are routinely subjected to unskippable trailers and multiple FBI warnings. Ironically, encouraging the very thing it was intended to discourage. You cannot emulate this. Your legitimate, paying customers should always receive the superior experience. Then compare it the illegal alternative, a sketchy free streaming site, which is the exact opposite of all of the above. Even though illegal streaming sites are free, Netflix offers a superior experience. That’s why illegal streaming sites make chump change, and Netflix is a $77 billion dollar company. That’s okay, you can apply the same principles to your own digital content production. Let’s say you’re selling a course, for example. Add a discussion forum so other students of the course can interact with each other and help each other out. Offer a support email address so students can ask private questions to you and your support agents. Offer live Q&A sessions so students can ask questions and (some can) get instant answers. Offer periodic course updates based on feedback from customers and your own self-editing. Use AppPresser to offer an app for students to consume content on the go. Of course, the above-listed resources would only be available to paying customers. Whatever you do, don’t just sell a zip file full of videos, and that’s it. Offer something that a pirate can’t possibly compete with: a superior experience. Notice the title of this post refers to discouraging piracy, not preventing it. Because you can’t prevent piracy. You name a piracy “prevention” technique, and I’ll name a way around it. DRM protected music? Record your audio output. Here’s how to on Windows and Mac. Disabling highlighting prevent text from being copy and pasted? Use Developer Tools. Disabling right-clicking to prevent images from being saved? Screenshot. Periodic “phone home” license checks? Firewall. Sending DMCA notices to pirates already sharing your content. Akin to playing whack-a-mole. It’s an endless battle. Any action you take will not actually prevent privacy. Where there’s a will there’s a way. Any action you take will put off legitimate customers and degrade their experience. Focus on offering a superior experience, and pirates won’t be able to compete with you.